The best-selling author of Franklin and Winston offers an incisive historical portrait of religion and politics in America, from the colonial period to the present day, and cites the need for contemporary society to embrace the principles of the Founding Fathers. Reprint. 100,000 first printing. Amazon.com description: Product Description: NEW YORK TIMESÂ BESTSELLER â¢ In a fascinating book thatâs perfect for Fatherâs Day,Â Pulitzer Prizeâwinning author Jon Meacham revealsÂ how the Founding Fathers viewed faithâand how they ultimately created a nation in which belief in God is a matter of choice. At a time when our country seems divided by extremism, American Gospel draws on the past to offer a new perspective. Meacham re-creates the fascinating history of a nation grappling with religion and politicsâfrom John Winthropâs âcity on a hillâ sermon to Thomas Jeffersonâs Declaration of Independence; from the Revolution to the Civil War; from a proposed nineteenth-century Christian Amendment to the Constitution to Martin Luther King, Jr.âs call for civil rights; from George Washington to Ronald Reagan. Debates about religion and politics are often more divisive than illuminating. Secularists point to a âwall of separation between church and state,â while many conservatives act as though the Founding Fathers were apostles in knee britches. As Meacham shows in this brisk narrative, neither extreme has it right. At the heart of the American experiment lies the God of what Benjamin Franklin called âpublic religion,â a God who invests all human beings with inalienable rights while protecting private religion from government interference. It is a great American balancing act, and it has served us well. Meacham has written and spoken extensively about religion and politics, and he brings historical authority and a sense of hope to the issue. American Gospel makes it compellingly clear that the nationâs best chance of summoning what Lincoln called âthe better angels of our natureâ lies in recovering the spirit and sense of the Founding. In looking back, we may find the light to lead us forward. 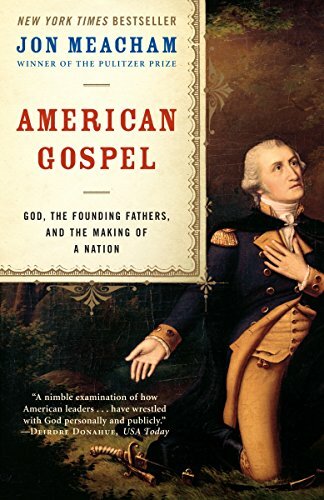 About: Author Meacham tells the human story of how the Founding Fathers viewed faith, and how they ultimately created a nation in which belief in God is a matter of choice. About: In American Gospel (literally meaning the "good news about America"), New York Times bestselling author Jon Meacham sets the record straight on the history of religion in American public life. About: Offers an historical portrait of religon and politics in America, and cites the need for contemporary society to embrace the principles of the Founding Fathers.